Senior lecturer Mukashev Zhumagali Korzhynbaeva was born 24 September 1965, p. Sonali, kurgaldzhinskiy district of Tselinograd region. In 1982 he finished 10 classes of high school farm Carbidic of kurgaldzhinskiy district of Tselinograd region. And in the same year he entered the Karaganda order of the red banner of labor Polytechnic Institute at the mining faculty. In 1989 he graduated from the Institute and received a diploma with qualification “Mining engineer”, construction of underground structures and mines. He received a diploma of Karaganda economic University with the qualification “Jurisprudence”. He received a diploma of the University “Bolashak” with the qualification “Pedagogy and psychology”. In 1983 to 1985 conscription service in the Soviet Army. Since 1989, the mine foreman in Dzhezkazgan chahta bore trust. 1990-1994-service Department of internal Affairs of Karaganda. From 1994-2001 Karaganda Republican military school. twice hero Talgat Begeldinov, the position of the education officer, the platoon commander of a group of military specialists. Since 2001-2012 Karaganda Republican military school. 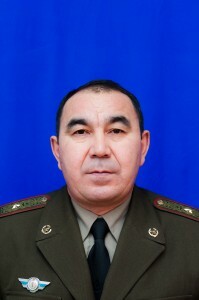 twice hero Talgat Begeldinov, the position of the senior officers, the commander of the group of military specialists. From 2012 to the present time senior lecturer of the Department of IP KSTU. Certificate of advanced training “Orleu”, Almaty, 2014. III дарежелi «Miнciз кызметi ушiн». II дарежелi «Miнciз кызметi ушiн». «Казакстан Республикасынын Карулы Куштерiне 20 жыл».